CLICK HERE TO GET YOUR FREE 20"x30" SHOWROOM BLANKET SAMPLE! 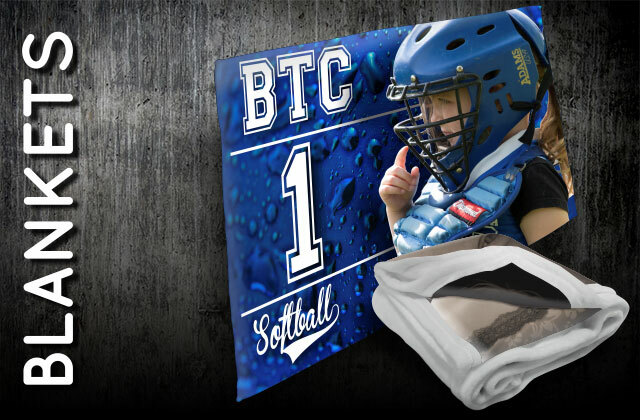 Personalized items are getting popular these days. This does not mainly express your personality and thoughts but this can serve as a souvenir and gift too. Since photograph captures great memories, you can now transfer it on your blanket for personalized use or gift to someone special. This photos can be a family picture, your pet, you lover, wedding photo and a lot more; anything special that you wanted to be reminded of. New & Improved Super Soft Plush! New technology is the one responsible for these fascinating art pieces. Colored digital format photo with high-resolution is utilized during the process. Finish product appears unique and beautiful which will make you feel happy and warm. 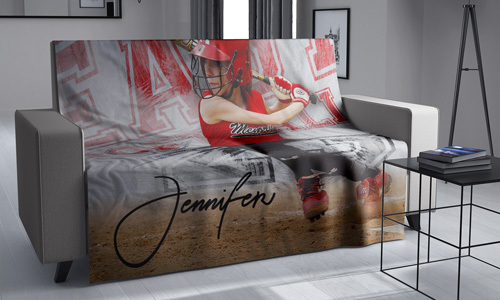 Apart from high quality photo, this process won’t be successful without the use of advance and state of the art dye sublimation printing –a new method of printing. 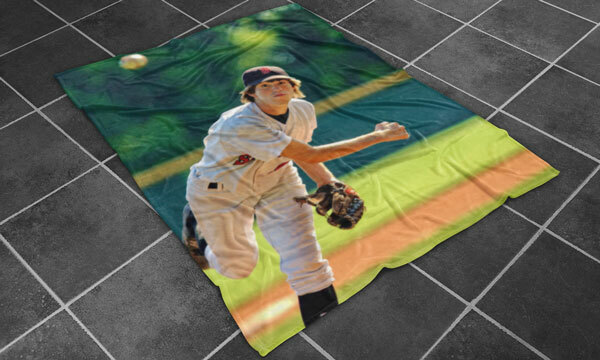 Click Here to get a FREE quote from S&K for next Blankets printing job! As each blanket is individually sewn, there may be slight imperfections in the squareness of the blanket itself so it is highly recommended that you do not have any borders or hard edges near the edge of the blanket as these may cut off or look askew. We will do everything we can to ensure that the print is as straight and aligned as possible, but slight variations will happen. Please make sure that you keep all important artwork at least 2-3 inches inside the 50x60 rectangle. This will help to minimize anything being cut off if the blanket is not square. Please note that the blanket, when pressed, may/will have white fibers under the areas that are pressed with artwork. This is the result of the fibers laying down on top of others and those under fibers are shielded from getting artwork. Once washed this gives the blanket a slightly softer look to the artwork. This is normal! All of our products come with a possible 10% quantity +/- increase/decrease total. These will be mostly seen with larger quantity items such as our stickers/decals, dye sub transfer sheets, mousepads, etc where there are high quantities with the same artwork on each item. The customer will be responsible for any charges for these overages at the same rate per item along with rest of the quoted order. 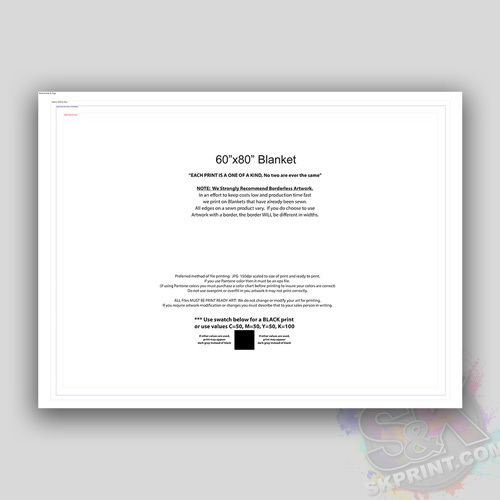 The blankets should only be pressed on a VERY Large press, minimum of 62x52 inches or a wide Rotary Press. As the blankets are very large they will NOT fit in a standard sized press. 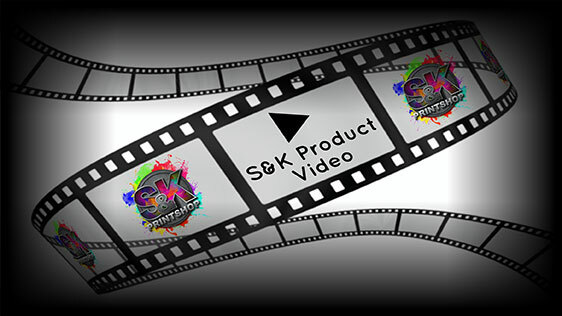 S&K is able to press multiple blankets on our large format rotary press which helps to minimize labor time, which helps us keep our costs down!